Seriously consider a life without back breaking snow removal. Can you picture it? Are you smiling? Well, having a radiant snow melting system right outside your front door makes manual snow removal unnecessary. If you put a heated driveway to work for you, chances are you’ll enjoy winter a whole lot more. Thanks to radiant heat technology, there is no longer any need for strenuous manual labor or corrosive salt and snowmelt chemicals. Heated driveway systems are fully automated, so feel free to sleep in or enjoy your morning coffee from the warmth of your living room. 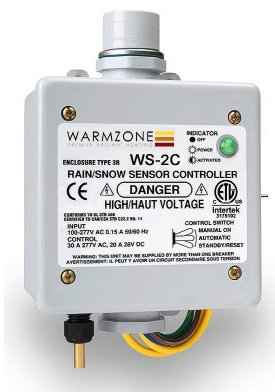 When temperatures are below a set point (usually 39°F) and the aerial or pavement mounted snow sensor (◄ aerial mount sensor pictured left) detects moisture, it signals the controller which then sends power to the heat cables, outputting a steady stream of warmth to keep your driveway clear of snow and ice. Once the snowflakes hit the warmed surface they don’t have a chance to accumulate as they melt on impact, leaving you with a heated driveway constantly clear of snow. The snow is left to accumulate where it is more appreciated, like your front yard (for optimal snowball fights, snowmen, or snow caves) or even your next door neighbor’s driveway. If you’ve told your neighbor’s about your heated driveway and they still haven’t installed a radiant snow melting system of their own, you have every right to silently snicker at them as you watch from the warmth of your front window as they huff and puff to remove their snow by hand. 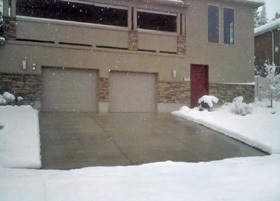 If you make a radiant heated driveway work for you, your manual snow removal days are over. Forever.